Medium Density Upholstery Foam ( Cushion Sofa chair couch replacement Upholstery sheet) 5" Thickness x 30" Width x 72" Length :: Shop By Foam. Our foams are made in the USA! Medium density foam has a compression rate of 36 lbs. 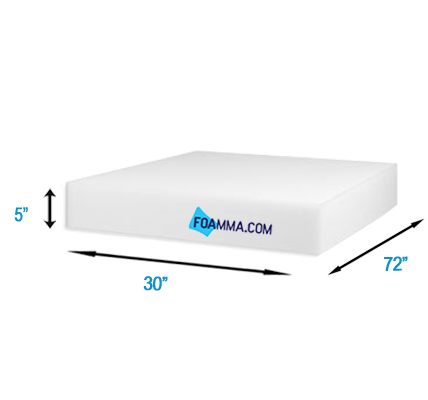 This means for every 36 lbs on a general idea, your foam will compress by 1 inch. Medium density foam is designed for that nice sink effect for those who dont want something too firm. 100% recovery rate, durability : durable, Medium density foam suitable for long-term use. All foam sheets are sold per sheet not per yard and rolled for packaging. Packing, shipping & cutting foam packages need to be opened immediately once you receive the package. Do not let the foam sit unopened for more than 1 week. Do not open with a box cutter. Use a ball point pen or a pencil. Start by making a little incision and break it from there. Durability : will last 7 to 10 years. Care instructions : when unpacking, allow at least 2 days for the foam to breathe in order to recover its original size and form. Ideal uses for foams are for Mattresses, Chair Pads, Seat Pads, Cushion, Chairs, Furniture, Pillow, Seat Cushions, Chair Cushions, Patio Cushions, Furniture Cushions, Rocking Chair, Car Seats, Upholstery Repair, Chair Upholstery, Foam Mattress, and Mattress.